10:30 a.m. – 12:03 p.m. Snow may still be on the ground, but there will be plenty of green all around when MARP meets in Kalamazoo on St. Patrick’s Day. Our guest speaker will be Shasta Duffey who is the Vice-President for Sales and Marketing for Grand Elk Railroad. Grand Elk, a division of Watco, is based in Kalamazoo and carries freight on the former Grand Rapids & Indiana line between Elkhart and Grand Rapids. Ms. Duffey gave a well-received presentation at the Michigan Rail Conference last fall at Macomb Community College that was attended by several MARP members. She will bring us up to date on the operations and outlook for the short-line freight business in West Michigan. She may also be able to give us some information on an interesting venture involving Watco and Iowa Pacific Holdings in a proposal to begin scheduled passenger service on the “Sooner Sub” between Tulsa and Oklahoma City. Some of you may choose to take the train to Kalamazoo. Amtrak has sweetened the pot with 20% savings on the Midwest Winter Warm-Up Sale. Click here to make your reservations. Please email marprail@yahoo.com if you plan to arrive by train. We will have cars at the station to take you to the church. If you are driving to the meeting and can be at the station to meet the Wolverine at 9:35a or the Blue Water at 10:25a, please reply to this email. Note that the meeting will start a bit later than usual to accommodate those arriving by train. We will have lunch at the Old Dog Tavern, located next to track used by Grand Elk. Some of you will remember the outstanding Pasty’s served at the Old Dog, the venue of our previous meeting in Kalamazoo. 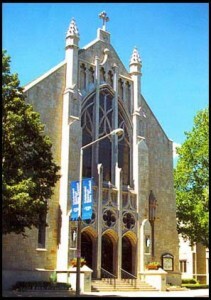 The First Methodist Church is on the west side of downtown Kalamazoo, one of the 5 churches that surround Bronson Park. First Methodist is the church across from the northwest corner of the Park. Photo & Directions are here. Our new West Region Chair, Warren Fritz, is hoping for a good turnout of folks from this corner of the state. During or after lunch, he would like to gather you together to talk about some ideas for the region, one of which is planning for a possible visit of the Amtrak Exhibit Train to Grand Rapids in June. Hoping for a big crowd! There is much to do in downtown Kalamazoo. If you’ve got the winter blues, you might consider making a weekend of it. Below are some ideas. The RockShow Ultimate Journey Tribute This show at the recently refurbished Kalamazoo State Theatre will take you back to the days when Journey topped the charts.